It’s a super-sized issue of SUPERGIRL! Supergirl and Krypto go back to the ‘scene of the crime’-the ruins of Krypton! With Z’ndr hitchhiking, Supergirl is not only there to find clues on who the killers of Krypton are, but to pay her respects to her dead family and friends for the first time since she left the planet. But a mysterious caretaker whose duty is to protect Krypton’s remnants at all costs attacks and won’t let Kara through! 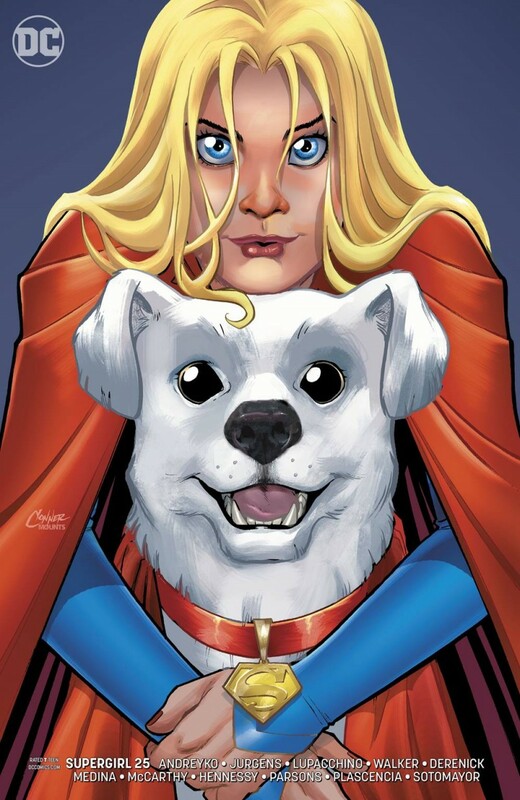 As if that weren’t enough, the Kryptonian powerhouse and her super-powered pooch are stricken with radiation poisoning from the dead planet and must also fight their inner demons! This anniversary issue also includes two backup stories! First, witness the thoughts and fears of Krypto as he is affected by the radiation poisoning from the wreckage of Krypton. Then, learn more about our new hitchhiker, Z’ndr Khol, as he scavenges a booby-trapped ruin in a remote corner of the galaxy in an off-the- wall space adventure!